The S.P.S. 9" Custom Rear End Housing is machined from selected 9" cores. Stock tubes are replaced with 3" x .188" wall 4130 tubes and fabricated modular style rear cover replaces original light weight stamping for both added strength and style. Complete with S.P.S. ¼” 4-link brackets, lower shock mounts, upper and lower wheelie bar mounts, third member attachment studs, drain plug, fill cap, back braced, and internally braced which gives the housing added strength without excessive weight. Housings are constructed using a special dimensionally accurate fixture made exclusively for this project assuring vertical and horizontal alignment with zero tolerance. Each is completely welded and machined with the final step being the installation of the bearing ends. This housing is built for your specific width requirements with housing ends of your choice. The best direct bolt-in replacement rear end housing on the market. For ‘82 - ‘92 and ‘93 - ‘01 “F” bodied GM cars. We have tried them all and this is the best! 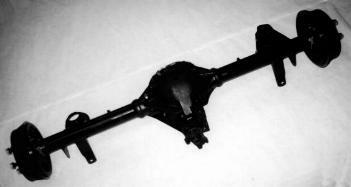 This housing features a finely cast 12 bolt centre section with beefy casting lugs for torque arm mounting. The centre section is accurately machined on CNC mills. 3” chrome moly axle tubes are pressed and heliarc welded to the housing. 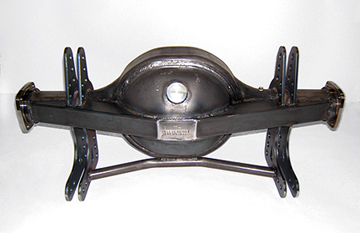 Large bearing (Olds and big Ford style) housing ends are jig welded on axle centre lines. New factory GM mounts for control arms, spring pads and shocks are jig located and heliarced in place. New GM backing plates are machined for bolt-on drum brake applications. This housing features much more . . . it is the best! Available in 2 standard widths. As well, custom widths are available on special order. Fits ‘82 - ‘92 and ‘93 - ‘01 Camaro and Firebird. Available with Strange or Mark Williams axles. Available completely assembled with spool, your choice of gears, brakes asembled, etc. Please call for quote.